A chair for the office or for the home. 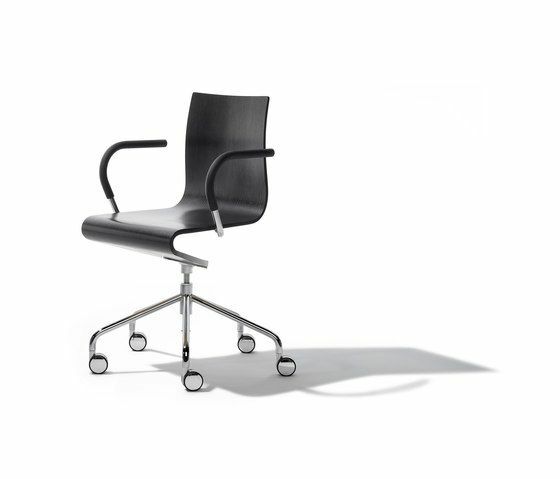 A chair for work, for conferences and meetings. A space to develop ideas, to think, all the while rocking gently. With its gentle rocking motion, the Seesaw chair inspires us to move, to stretch and to get up every now and again instead of remaining in the same position for a long time. A comfortable chair with great ergonomics that keeps the user active. Similar to Mart Stam’s famous cantilever chair, this function is enabled by an additional curve in the bentwood material. Innovative, perfectly shaped and natural. Seesaw meets all the requirements of a great, individual and comfortable chair: height adjustment, flexibility and great ergonomics. Originally fitted with a locking spindle for height adjustment – which, for us, is an archetype – the Seesaw has also been available with a gasdamped spring since 2014. RICHARD LAMPERT: DESIGN ICONS AND CONTEMPORARY DESIGN In 1993, Richard Lampert founded his company, based in the German city of Stuttgart, with the aim of producing innovative and versatile furniture for everyday use.